Vegetables grown in on-campus gardens help push the school toward the goal of boosting the share of "real food." 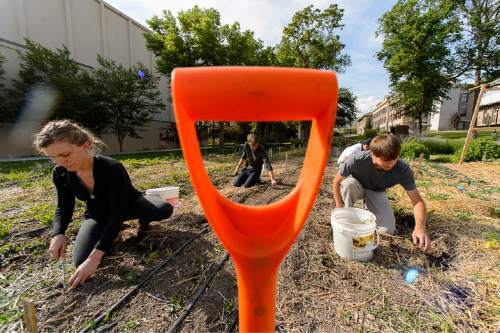 Trent Nelson | The Salt Lake Tribune Students work in the Edible Campus Gardens at the University of Utah, Thursday June 4, 2015. The University is pledging to put 20 percent of its food budget toward "real food" by 2020. The state's flagship school of 30,000 joining dozens of campuses nationwide in a "Real Food Challenge." Right now, estimate leaders of a U. student group estimate that about 11 percent of U. food is "real," meaning it is local, humane and tended by workers who are paid fair wages. The U. buys produce from local farms, as well as on-campus gardens. 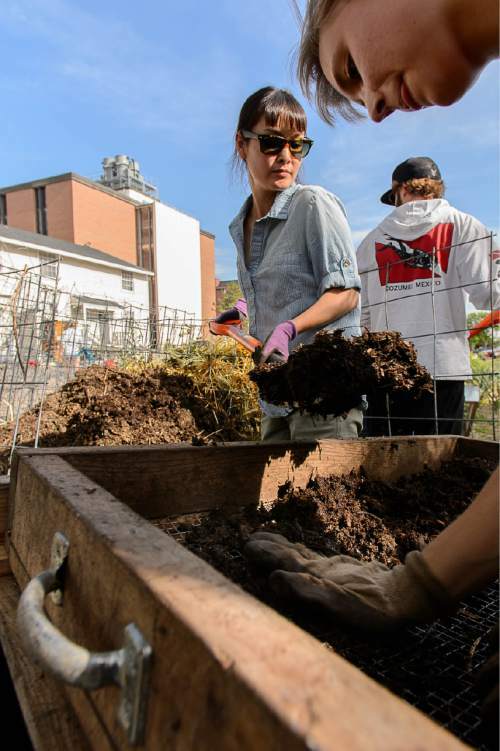 Trent Nelson | The Salt Lake Tribune Rachel Fong and Ashlea Patterson sift compost at the Edible Campus Gardens at the University of Utah, Thursday June 4, 2015. The University is pledging to put 20 percent of its food budget toward "real food" by 2020. The state's flagship school of 30,000 joining dozens of campuses nationwide in a "Real Food Challenge." Right now, estimate leaders of a U. student group estimate that about 11 percent of U. food is "real," meaning it is local, humane and tended by workers who are paid fair wages. The U. buys produce from local farms, as well as on-campus gardens. 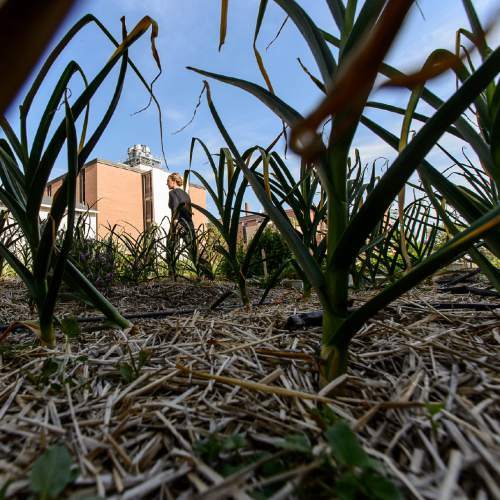 Trent Nelson | The Salt Lake Tribune Marykate Glenn walks through the Edible Campus Gardens at the University of Utah, Thursday June 4, 2015. The University is pledging to put 20 percent of its food budget toward "real food" by 2020. The state's flagship school of 30,000 joining dozens of campuses nationwide in a "Real Food Challenge." Right now, estimate leaders of a U. student group estimate that about 11 percent of U. food is "real," meaning it is local, humane and tended by workers who are paid fair wages. The U. buys produce from local farms, as well as on-campus gardens. 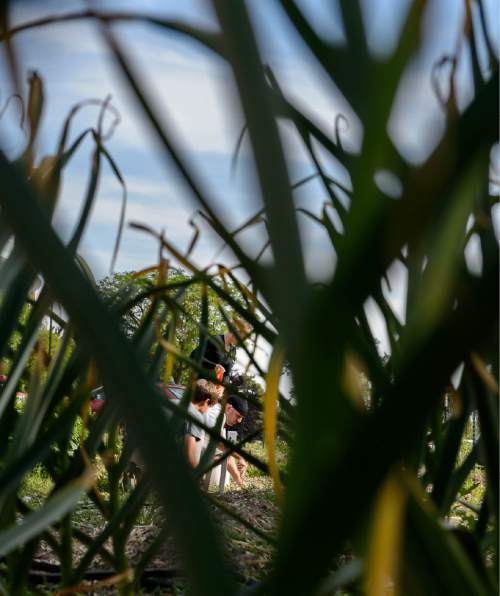 Trent Nelson | The Salt Lake Tribune Marykate Glenn, Matthew Briggs, and Steven Dama at work in the Edible Campus Gardens at the University of Utah, Thursday June 4, 2015. The University is pledging to put 20 percent of its food budget toward "real food" by 2020. The state's flagship school of 30,000 joining dozens of campuses nationwide in a "Real Food Challenge." Right now, estimate leaders of a U. student group estimate that about 11 percent of U. food is "real," meaning it is local, humane and tended by workers who are paid fair wages. The U. buys produce from local farms, as well as on-campus gardens. On a slow summer day at the University of Utah&apos;s athlete dining hall, executive chef Peter Hodgson labored over a bit of beef. With grill marks just so, Hodgson served filet mignon with Muir Copper Canyon Farms microgreens and mushroom sauce to Jeff Rudy, the U.&apos;s football-operations director. By 2020, the school has pledged to have such fresh, local meals  if homelier ones  for anyone eating in campus cafeterias or sandwich joints, not just athletes and their coaches. Twenty cents of every dollar in the school&apos;s dining budget, President David Pershing and his staff vowed, will go to "real food." "They&apos;re definitely aware that this is a generational shift," said David Schwartz, campaign director for the Boston-based Real Food Challenge, "not just a momentary blip on the radar screen." U. administrators announced the pledge a few months ago, heeding national calls from student advocates. And the school is making progress. But real food is a big bite. This year, the U. spent $2 million on food and drinks alone. With roughly 30,000 students, Utah&apos;s flagship university is the largest school to join the challenge so far. Even so, Schwartz noted, the commuter school pays less to feed students than other state schools such as the University of Massachusetts Amherst. Joining the challenge is a matter of school leaders doing "due diligence" for roughly 2,200 U. students with meal plans and up to 8,000 others buying coffee and meals on campus each day, said Reggie Conerly, dining services director. Students in the U. chapter of the national group credit Conerly for leading the push. The definition of "real food" is somewhat slippery. To qualify, ingredients must fit at least one of the following criteria: They must be local, meaning they travel less than 150 miles. They must be "fair," meaning workers are paid livable wages. They must be ecologically sound, or in other words, organic. And they have to be humanely raised, such as cage-free chickens or pastured cows. To date, at least 11 percent of U. food is real, estimates Will Schott, a former intern hired by Conerly to do the math in 2012 and 2013. The actual proportion might be lower, because Schott&apos;s analysis did not consider sales from Papa John&apos;s and Pepsi. But, he said, the U. has made strides since then: It buys cage-free eggs and Salt Lake City-based Wasatch Meats. "It doesn&apos;t have to be all in one chunk," said Schott, an incoming U. medical student. Even small steps are a good investment in students&apos; health and Utah&apos;s economy. At other colleges, Schott&apos;s counterparts have struggled to hold contractors accountable. Four student researchers at the University of California, Santa Cruz, discovered that some reportedly local ingredients had traveled farther than the contractor revealed, said Tim Galarneau, education coordinator at the Center for Agroecology and Sustainable Food Systems. The school of roughly 16,000 undergraduates is in the midst of transferring its $8.2 million annual food budget to another company. The California university has doubled the commitment of most schools, at 40 percent, and constantly combs data to determine the miles, wages and environmental effects behind 27,000 daily meals. "We&apos;re building the ship while we sail it," Galarneau said. At the University of Utah, the new model could end up saving money, chef Hodgson figures. Utah produce travels fewer miles, arrives fresh and keeps a day or two longer in the fridge, preventing cooks from having to toss it, he said. Others noted sustainability isn&apos;t just about the backstory. Once it reaches dining halls, efforts to compost uneaten food, limit portion sizes and reduce the number of options can also help save resources. But anyone expecting fully organic menus at the U. will be disappointed. Conerly concedes pesticide-free tomatoes and free-range turkeys are more costly. But he still plans to fork over a bit more for some organic produce. He expects the cost of meal plans to hold steady as the school brings in more mushrooms from Filmore and stone fruit from Santaquin. University cooks also are sautéing kale and tomatoes from on-campus gardens. Money spent on sustainable food choices at 10 dining centers is offset by hefty revenue from Starbucks, Einstein Bros. Bagels, Coca-Cola and other vendors renting space on campus. The U. reaps an additional $150,000 from vending-machine drink and snack sales, said Jerry Basford, associate vice president for business and auxiliary services. The athletics cafeteria is separate, but anyone can visit the buffet for $10 to $15, depending on the meal. Even if the U. is successful in meeting its goal, Conerly doesn&apos;t expect everyone to be satisfied. In response to demand, some campus stores now offer snacks that are free of genetically modified ingredients. And Conerly believes calls for GMO-free sandwiches, pizza and salads "are coming down the line." Local, meaning they travel less than 150 miles. Fair, meaning workers are paid livable wages. Ecologically sound, or in other words, organic.